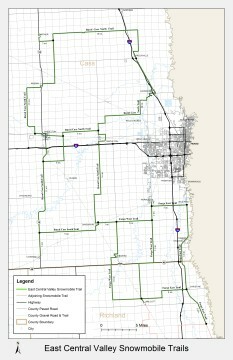 The East Central Valley trail system is located in the southeast portion of North Dakota and primarily covers Cass County. It is about 20 miles from two different points on the Mayville-Portland Trail System (21 miles from Hillsboro and 17 miles from Galesburg). This trail also connects to two Minnesota trail systems managed by the Clay County Trail Blazers and Felton Roughriders.